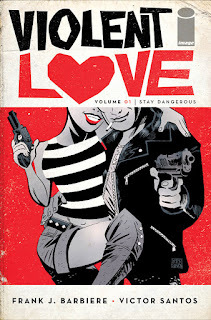 Creators Frank J. Barbiere (FIVE GHOSTS, The Revisionist) and Victor Santos (THE MICE TEMPLAR, Polar) will release the first trade paperback collection of their pulpy romance series VIOLENT LOVE this May. Oozing with style and action, VIOLENT LOVE is the tale of Daisy Jane and Rock Bradley, two of the most notorious bank robbers in the American Southwest—who fell in love. VIOLENT LOVE TP VOL. 1: STAY DANGEROUS (ISBN: 978-1-5343-0044-6) hits comic book stores Wednesday, May 24th and bookstores Tuesday, May 30th. VIOLENT LOVE TP VOL. 1: STAY DANGEROUS is available for preorder via Amazon, Barnes & Noble, Indiebound, and Indigo.